29th March 2009 Amended Vice President's Call-sign in October Report. Added December's Meeting Reports. With the credit crunch and increased fuel bills who can afford that new all singing and all dancing IF DSP transceiver ? (You know the one that makes your tea and toasts your cheese sandwiches whilst you are working that illusive VK6). Andy's talk will show you how to open up the exciting area of space communication and it will cost most of you next to nothing as you probably already have the necessary equipment. But there is just one catch, it's called Home Construction. So if you want to have ago at expanding your hobby and are not frightened of a hot soldering iron then come along for what will hopefully be a light-hearted but serious look at Amateur Satellites. Andy has arranged for a Satellite to pass over Beehive Lane at about 8pm so there my even be a live demo !! This is an interesting Amateur Radio subject - remember OSCAR 7? Terry introduced himself as G0BXL and a Member of the Harlow & District Amateur Radio Society, Titanic Society and he works for St Clere Hospice (off the A11) and Essex Stroke Club. 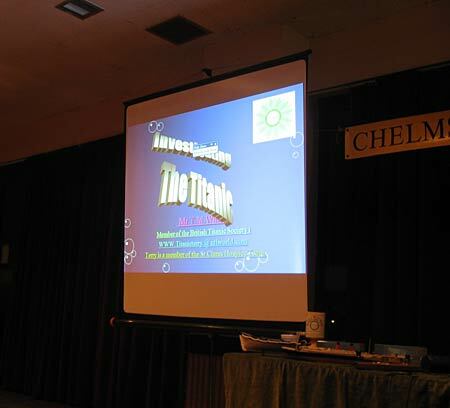 He was also involved with the Titanic Wireless Group from Godalming, in Surrey who operate a special Titanic event every 5 years due to Jack Phillips, the Radio Operator on the Titanic, who was born locally. GB90MGY (the Titanic's Call-sign being MGY). The picture on Terry's QSL Card was the authentic construction of the Titanic Radio Room used for the GB90MGY special Titanic event. The equipment was on loan from a number of Museums. The Potato was a staple diet throughout Europe but between 1852 and 1900 there was a massive failure of crop so people had to leave their countries in search of a better life. By 1910, 62% of all peoples in America were from this migration. To set the scene he told of the wages typically people were paid; a Manual Worker - 90p/Week and a Railway Clerk - £1.50. By 1900 the English ship building was in a poor way but the Government of the time realised that if War was declared by anyone we would be lost so they poured money into ship building. New machinery was installed and although they were building Passenger ships they were controlled by the Navy as they could be converted to Troop Carriers. The Titanic was built in the Harland & Wolff shipyard in Northern Ireland using new equipment. Panels were made in pairs - one for each side of the ship. There were assembled using a compound and heated rivets driven through the retaining holes and banged over to form a head. It is the quality of these rivets which modern science now questions. The ship had 3 engines, one centrally located and a smaller one each side with a Funnel for each - the 4th Funnel was to ventilate the Kitchens. 29 boilers were stoked by 300 Stokers using coal - there was a coal strike in operation & the amount of coal was less than that really required - the wrong grade was loaded to some of the boilers and caught fire while still in the bunkers. The Titanic set sail and as it appoached America 7 Iceberg Warnings were received by Jack Phillips, the Marconi Wireless Operator. These were personally delivered to the Bridge but the speed of the vessel was not slacked much, if anything. The Lookouts were exposed to the cold rushing air and not provided with binoculars. Terry's theory was that Captain Smith would run out of Coal if he stopped for the night (as the California had due to the proximity of Icebergs) and would be late arriving in New York. He dispelled the idea that they were out to set a record for crossing the Atlantic - this was held by smaller & much faster German ships than the Titanic at this time. They struck the Iceberg and started to take in water. CQD and SOS was sent alternatively. 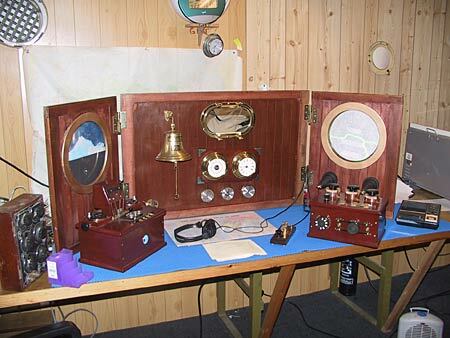 Terry normally takes around this display, a mock-up of the Wireless Room on the Titanic and was produced used for the special Titanic event to commemorate the 90 years since it sunk. The California did not respond as it had shut down its Wireless Room having been "told off by Titanic" as it was interfereing with Titanic's traffic. The power of the Titanic TX was 10KWatts with a 7.5KWatt TX on board to be tested for the Navy. 4 Watertight Bulheads were breached. There were only 70 Lifeboats and 1,500 Life Jackets. It sank in 2hrs 40 minutes. 700 were saved, 1,700 died but it could have had another 800 persons on board! Terry showed many photographs of Icebergs in various stages afloat - on this night there was no Moon & the sea was very calm - this resulted in no waves being visible braking on the Icebergs and making it very difficult to see. The ship blew into two parts as it sank - the boilers exploding would help this action. Captain Ballard of Woods Hole found the Titanic in the 1980s and this rekindled the public's imagination. His first dive confirmed its position & subsequent dives brought it a few relics. The French now own the Dive Rights & are symatically destroying it by removing vital parts. After the refreshment break Tery drew a large number of winning tickets to the now usual superb Raffle organised by Colin, G0TRM, Jeremy, M0DUT, Peter Graves and Geoff, G7KLV on Ticket Sales. Thanks to all organizers & those who supported the Raffle. After the Raffle Terry answered a number of questions. One being "How did the Private Messages get to the Marconi Wireless Operators?" Terry said that "the Titanic had 2 numatic tubes to the Pursors Office where the passenger would make out the Marconigram & pay the Pursor who would put it in the tube. Incoming messages would go the opposite way. The Titanic also had a speaking tube to the Bridge but custom dictated the Wireless Operator took the Message for the Captain to the Bridge personally to ensure it was delivered." A facinating story well told and illustrated - thank you so much. October Meeting - Annual General Meeting. The Chairman welcomed our many Members and Visitors and the programme for the evening was explained. The Meeting started by remembering Silent Key, Anthony Martin, M1FDE who passed away on the 20th September by showing photographs from the CARS Web Site of Anthony at CARS Meetings and of his Funeral on 2nd October at St Mary’s Church, Great Baddow. Carl took the floor and announced the Awards which were presented by President, Harry, G5HF. 1st – Ron Keefe, G4SIS. 2nd – Silent Key, Anthony Martin, M1FDE. 3rd – Richard Beck, M3YLB. First time Winner – John Yates, G1UZD. The “Amateur of the Year Award” went to Colin, G0TRM for his support to CARS at the GB96MWT Event, “Providing Sound” at each Meeting and doing sterling service as Assistant Secretary. The AGM was declared Open. Chairman’s and Programme Secretaries Report. Our Monthly Meetings Programme for the past four years has been the work of Martyn Medcalf, G1EFL – I will read out these as Martyn is still suffering from jet lag from America. November 2007 was a presentation by Elaine Richards who was then employed by Practical Wireless and now RadCom. December was a Social Photographic evening shared with Colchester. January was Software Defined Radios – one of Murray’s pet subjects. February was Micro DXpeditions with Roger Weston, G3SXW where he and a few mates whiz off to foreign places for a few days & operate Amateur Radio. March was a Social Meeting where two people came from Hylands House to tell us about its history. May - Leslie Butterfield, and RSGB Board member, described the International Beacon Project around the World. June – Colin organised the Table Top Sale and lots of people attended and sold/bought quality pieces of equipment. July was Solar Observing by newly Licensed Amateur Peter Meadows, 2E0ZBU. A large turn-out was delighted with his presentation aided by his Son Richard, 2E0SBU. John said it gave him great pleasure to see local talent presenting a CARS Lecture. Everyone who presents a CARS Lecture does go on to great things. Some have become a President of the RSGB, some the Head of their firm and more recently Microwave Manager at the RSGB. August was the Constructors Competition where there were such a large number of entries with an interesting and varied selection. September was scheduled to be The Enigma but unfortunately Eric Dean, M0DHM had to withdraw as his Wife was seriously ill. Peter Best, G8BLS stepped in & presented Radio & Brownsea Island. The Meeting showed their appreciation for the interesting meetings Martyn has arranged with a good applause. Sandford Mill: RSGB President’s Visit. Sandford Mill has occupied a fair bit of our time in the past year starting with the visit by Angus Annan, MM1CCR, the then President of the RSGB to present the Awards for the British Wireless for the Blind Fund in December 2007. As those of CARS Members who attended (and it was a good attendance) it was pretty cold there but hot tea helped. Angus was encouraged to call CQ using the Club Rig & worked a couple of stations – one said “please repeat your details”. Angus did and added “I am the President of the RSGB”. To which the Amateur replied “Have got to go now – goodbye”. He was not going to worry whether it was genuine or a wind-up. We have sent him a QSL Card to confirm it was genuine! 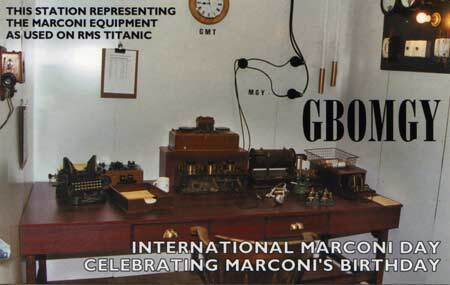 International Marconi Day. IMD was in April with CARS providing a HF Station & this year for the first time, Mark Sanderson, M0IEO provided his lovely caravan and VHF/UHF equipment along with Jim, 2E0RMI and Bob, G4MDB. A lot of people visited both Stations. The weather was wonderful. Peter Best, G8BLS brought a number of Scouts and also looked at the Museum pieces on display by the Marconi Hut. Event: Stock Windmill. Patrick was the next to stimulate some fun in May with Mark and his caravan at Stock Windmill over the weekend. Again, lovely weather and plenty of CARS Members visited. Event: GB96MWT. Final Days Of Marconi at New Street. June 6th provided a headache for Colin as G8DET was on holiday and Selex sprang onto CARS that they were holding a “Closing Event” which was scheduled originally for January, then Feb, and had been put back eventually to July. However with superb cooperation from Rod Wilkinson of Ofcom and hard work by Trevor, M5AKA, the Special Event Station, GB96MWT was issued in a couple of days. This enabled John G1UZD, Patrick M0XAP and Ken M3XBK to set up and operate a 100W HF transmitter site. 400 plus Marconi Veterans enjoyed good weather and a great social event at New Street which shut up shop shortly afterwards. Sandford Mill: National Field Day. NFD in June was organised by Steve, G4ZUL, CARS Contest, or as it is now called, Radio Sport Manager. Operators were Gwyn G4FKH, Andy G0IBN, Terrence G3GLL, Carl G3PEM, Rick G3YEC and Steve G4ZUL. – Thanks to them all. Event: Military Show - Langford. July provided the opportunity organized by Oliver Prin, 2E0WAA from Maldon to operate from the Museum of Power, Langford, near Maldon. Tony, G4YTG did a sterling job with his Bow & Arrow & nearly speared Brian in the process. David & Myra attended and did a great job with the Public. Sandford Mill Open Afternoons in August. In July, Selex sold three Transmitters to Tim Steele which he kindly donated to Sandford Mill. First Afternoon was HF – 2nd was VHF with James, 2E0GUA, 3rd was HF again and 4th finished a busy month with James again. Event: August Lightship at Tollesbury. Andrew, G0IBN kindly arranged for CARS to operate for the Weekend from the Lightship VESSEL-15 at Tollesbury. This was for “Lighthouses on the Air” and a number were contacted around the Country. Steve, Martyn, Rick, Jeremy operated and yours truly visited for a Photo Call on the Saturday. CARS President Harry, Ethel and two CARS members visited the Light Vessel for a personal trip during September – Thanks Andrew. Training Report by Clive, G1EUC. He said that CARS had undertaken two Foundation, one Intermediate and one Advanced Course and thanked everyone for their assistance. Carl was thanked for his efforts for the Advanced Course and a tribute was paid to Anthony for his generous contribution to CARS Courses and slide sets. Clive then specified the Courses in 2009. Presidents Report. Harry thanked the present Committee Members and the Chairman for all their hard work, which had helped to make the past year such a success. The Committee was stood down and the President took the Floor. The Existing Committee was projected onto the screen. It was first proposed that the Existing Committee was re-elected En Bloc. John, G8DET was then re-elected Chairman. John Yates, G1UZD was proposed to be a Committee Member. John has supported the many CARS outside activities and has accepted the role of Programme Secretary. Thank you John. To give John a help G8DET had distributed some slips of paper for Members to list what they would like CARS to do during 2009. No need to state your name or callsign. Simply ideas are what we want – Thank You. I now need to Vote onto the Committee the Publicity Duo: - David Davis, G3SVI and his Wife Myra, M0MYR. David and his wife operate an Emergency Postmaster’s Role for Post Offices where the Postmaster is ill etc. They are on such a call at present, which is why they are not here tonight. Proposer – Clive Ward, G1EUC. Martyn G1EFL is already on the Committee but it would be nice to formally vote him as Vice-Chairman. All in Favour – Carried. Thank you Martyn, you are Vice Chairman. Jeremy, M0DUT – already a CARS Committee Member has agreed to be our Minute Secretary. CARS Committee for 2008 to 2009. Close the AGM at 8.52pm. The Meeting then had a 20 minute refreshment break during which time, Harry, G5HF showed a series of beautiful photographs taken from the ISS as it passed over the Earth. This was followed by Murray projecting a superb 15 minute film of a Danish Amateur Radio Station OZ5E which had been rebuilt after damage. This was to the accompaniment of music, a chanting choir and Morse.